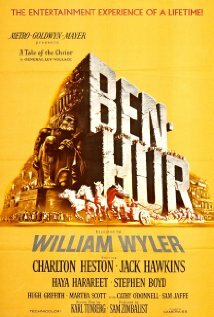 Netflix says: Charlton Heston plays Judah Ben-Hur, a proud Jew who runs afoul of ambitious boyhood friend Messala (Stephen Boyd) in this 1959 epic that boasts an unforgettable chariot race and earned 11 Oscars, including Best Picture, Best Actor (Heston) and Best Director (William Wyler). Condemned to life as a slave, Judah swears vengeance against Messala and escapes, later crossing paths with a gentle prophet named Jesus. I kind of can’t believe I’d never watched this thing all the way through. To be fair, it’s really long. So, as a kid, I may not have had the patience or the attention span to watch something like this. I know my family owned a VHS copy, but the fact that it was on two tapes was a little daunting. You know, something that I don’t think movies have enough of anymore is the Overture. And the Entr’acte. It was a pretty good movie. And that chariot race on disc 2 was pretty epic. Check it out.